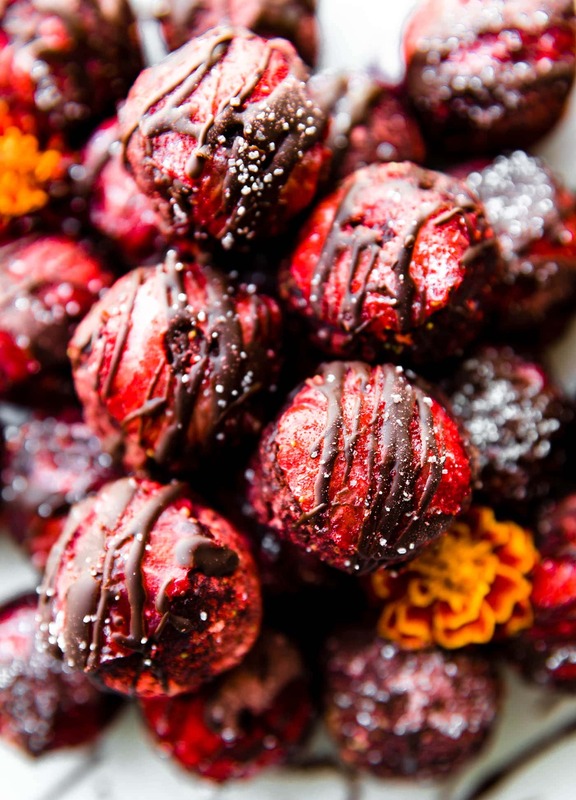 Strawberry Dark Chocolate Gluten Free Brownie Bites! 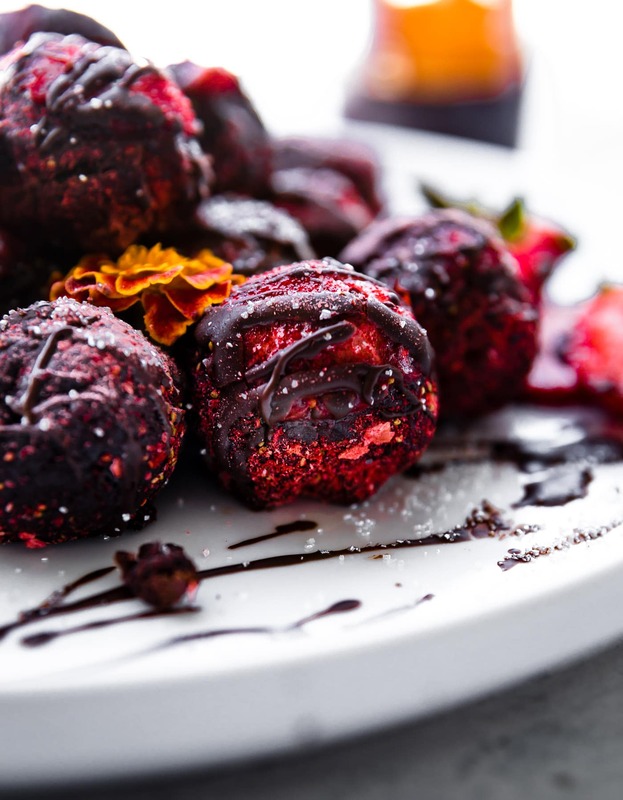 These Gluten free brownie bites with a delicious strawberry and intense chocolate flavor combination are the perfect bite sized dessert for Valentine’s Day. Dairy free options! Hey hey! It’s almost Valentine’s day! 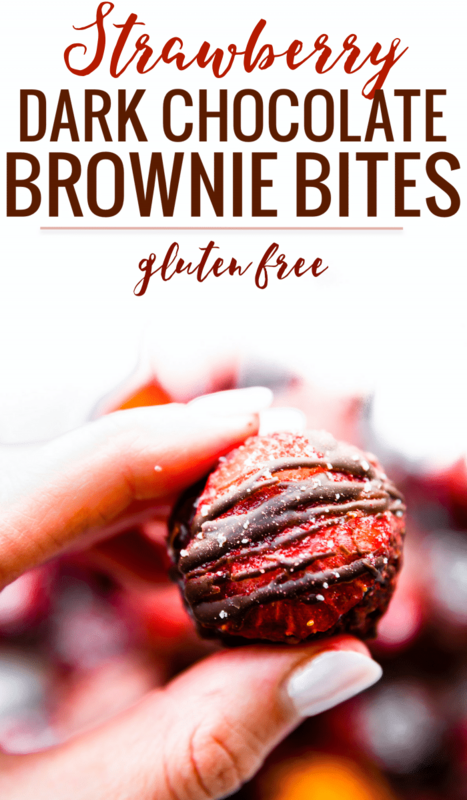 I’ve partnered with Bob’s Red Mill to bring you these Strawberry Dark Chocolate Gluten Free Brownie Bites with their Gluten Free brownie Mix! We are thankful for their wonderful Gluten free products handled exclusively in a dedicated gluten free facility. 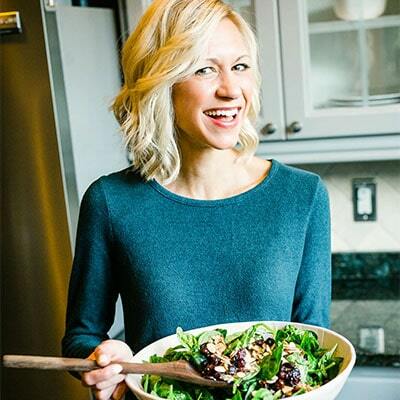 And thank you all for allowing me to continue to share gluten free recipes! So let’s begin the whole “best chocolate combo” conversation. You see, I think I changed my mind. No, in fact, I DEFINITELY changed my mine. 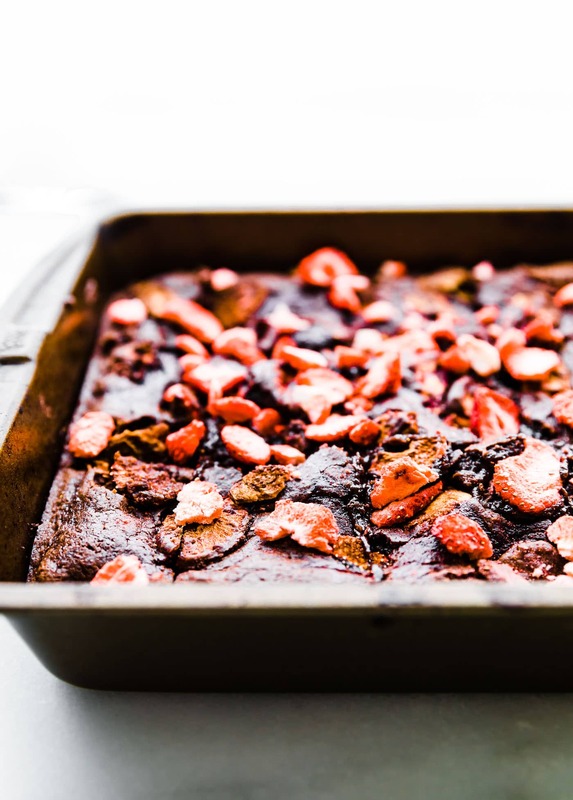 Dark Chocolate + Strawberry is an amazing combo WHEN, and only WHEN, you can eat it in a brownie. Preferably a gluten free brownie, and in bite size dessert form. Yep, for someone who isn’t really a fan of chocolate and fruit together, I now stand corrected. I’m ALL IN! Strawberries, dark chocolate, gluten-free brownie mix (for the brownies), melted dark chocolate. Like whoa! 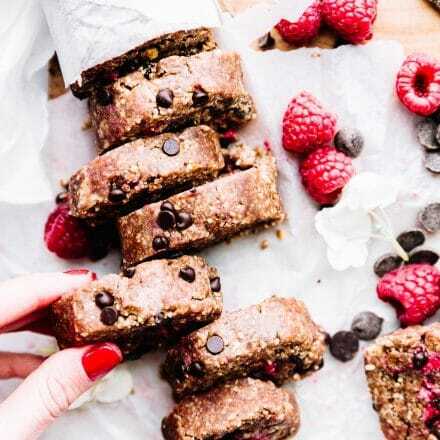 These gluten free brownie bites are BURSTING with FLAVAH! Okay I’m done. That’s all you need to know. Now go make some, mmm k? Kidding kidding. How could I leave you hanging. I’m sure you’re wanting a little more explanation. Like ….. why you should make these brownie bites (NOW! ), when you should make them, and how to make them . Am I right? Let’s answer this in list form. So we don’t get distracted. Shameless plug about to happen! Because they are the best chocolate combo out there! They are fudgy. They literally take 3 steps to make and minimal ingredients. All thanks to Bob’s Red Mill Gluten Free Brownie Mix (made with gluten free flours and soy free)! More on that below. 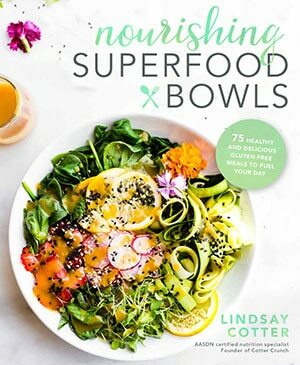 They are “healthyish” –> Lower in sugar compared to most brownies and a boost of Vitamin C. Ya that evens out the brownie part. Haha! And they will satisfy your sweet tooth in a refreshing way. When you should make these brownie bites? RIGHT NOW! Hey, it’s 5 days till the big Romantic Holiday where we can justify our NEED for chocolate . Hint Hint ––> Valentine’s day! Enough said. Go! How do you make them? But more importantly… How do you make these gluten free brownie bites GLUTEN FREE and in less than 45 minutes? Ya, that’s a better question. You make them by FIRST whisking up a batch on gluten free brownies using Bob’s Redmill Gluten Free Brownie Mix. Did you know they improved their batter mix and brownie recipe in 2015? Yes, they did! And it’s even more intense, chocolate wise! Okay I digress. 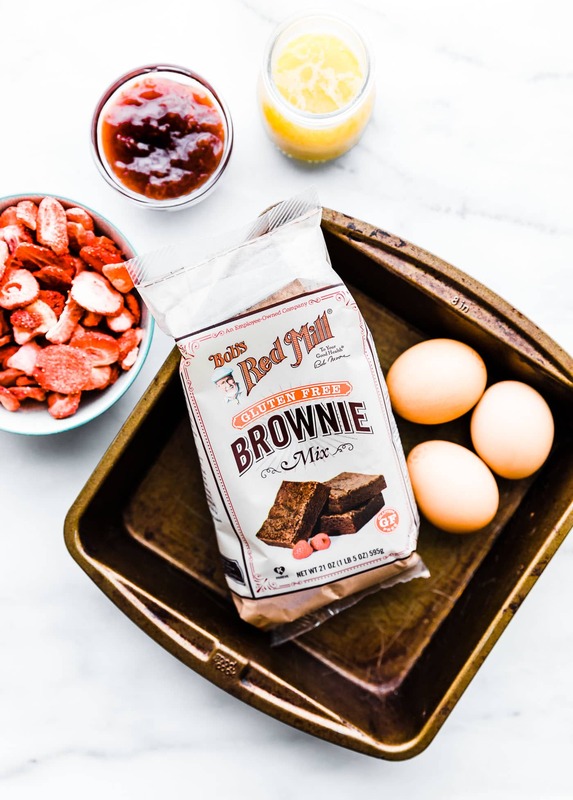 Along with the Bob’s Gluten Free brownie mix, you will need eggs (see recipe for substitutes), oil or butter, strawberry jam, strawberries or freeze dried strawberries, gluten free brownie mix, and Dark chocolate for melting. The key to slightly UNDER BAKE the brownies so that they are crispy on top but fudgy in the middle. Then once cooled, you simple roll them into balls/bites and freeze for 20 minutes. After they set, add sliced strawberry on top of each bite and drizzle with dark chocolate. I took it one step further and blended up freeze dried strawberry (to create a dye free pink powder) then sprinkled it on top. I know. I’m an overachiever. You’re welcome! 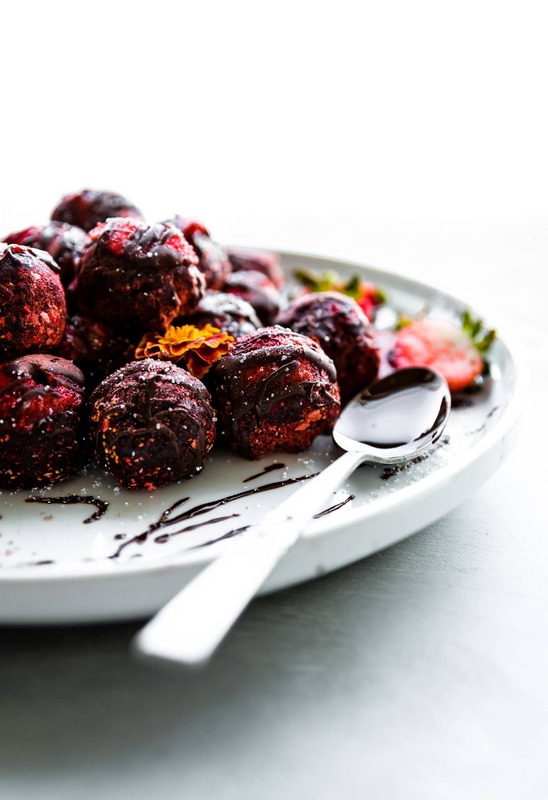 These Gluten free brownie bites with a delicious strawberry and intense chocolate flavor combination are the perfect bite sized dessert. Dairy free option. 1/3 to 1/2 cup butter (vegan butter or softened coconut oil work too). Use 1/3 c if you want them more dry and less fudge. Pre-heat oven to 325F. Pour brownie mix in a bowl and add ingredients needed according to instructions. For this recipe, I used Bob’s Redmill Brownie Mix. After pouring brownie mix into a large mixing bowl, add eggs, jam, and butter and mix well. Pour the batter into the prepared pan and spread evenly with a spatula. Add a handful of sliced strawberries on top. Bake until a toothpick inserted into the center comes out mostly clean. For fudge brownies, bake in an 8×8 pan about 40 minutes or so. You want the top to be crispy and inside more fudge like. If the brownies start to brown on the outside but still need baking in the middle, just cover with foil then continue to bake another 5 minutes. Mix up brownies into a crumble and place in a large bowl.Feel free to mix in optional 1/2 tsp berry extract or more sliced strawberries. Next, with your hands, roll batter into balls about that size of a golf ball. Optional COLOR pop! 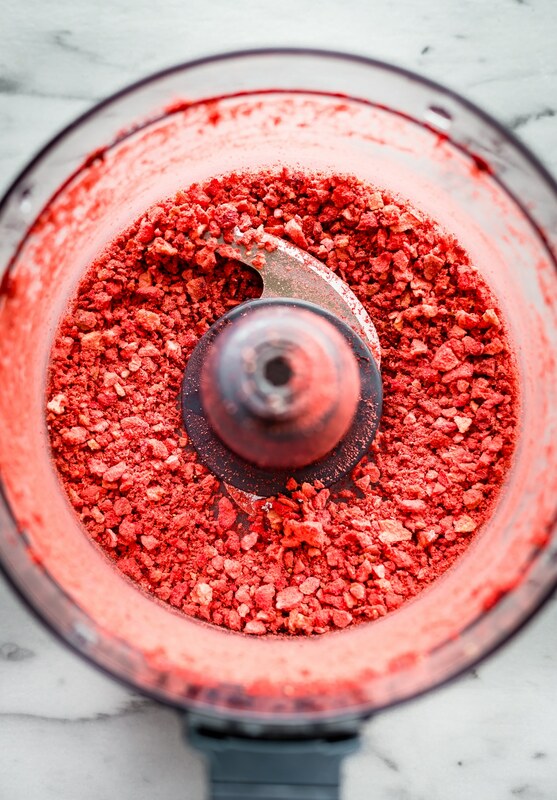 – Roll each bite in ground freeze-dried strawberries for color/decor. Place a thinly Sliced strawberry on top of each brownie bite. Fold/press each slice into the brownie bites so it seals to the top of the brownie bite. 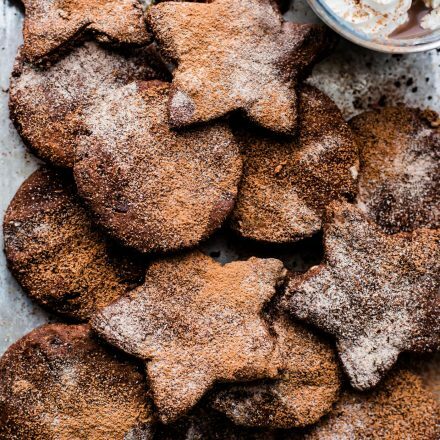 Continue to do so for each bite, then place on a cookie sheet or other pan/tray. Place brownie bites in freezer or fridge to set (I recommend freezer). 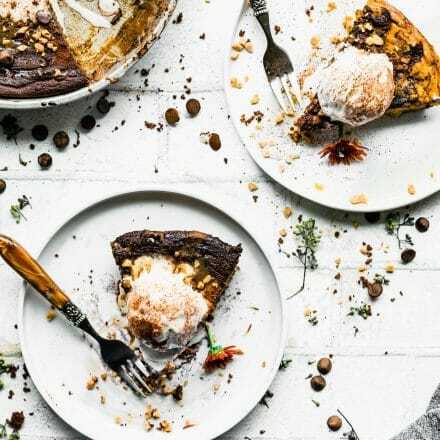 While the brownie bites are hardening in the fridge or freezer, melt your dark chocolate. Melt 1/4 to 1/3 cup dark chocolate with 1 to 2 tsp coconut oil. Heat in microwave in 30 second intervals or on stove top until all is melted, whisking between intervals. Once brownie bites have set, remove from fridge and drizzle dark chocolate eon top of each. Optional sparkling sugar to top. Freeze or place in fridge until ready to serve. Store in fridge or freezer for up to 3 weeks. See, A healthy-ish dessert bite loaded with fudgy chocolate and strawberry. Little effort to make, but lots of effort to resist. You’re veggie filled diet will have to resume post 2-14-2018! But you have my permission. Did I just say that? I did! Go, bake, roll, drizzle, and take a bite! Alright alright, you can chime in. What’s your favorite chocolate combo? Fruity? Salted? Caramel? Brownie Bite form? All of the above? You have no idea how many times I have made bites for nursing moms. Truly! Wish I could deliver. You are amazing and I’ve been thinking about you! <3 hugs to little one too. 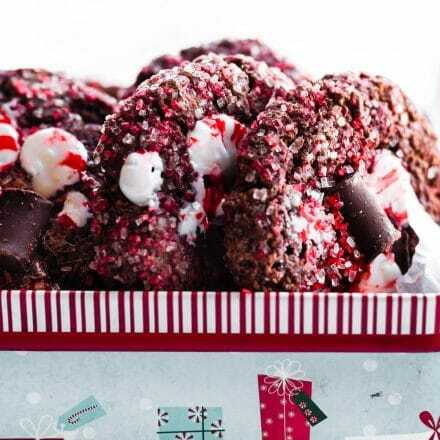 I LOVE how you used your gift for making beautiful bites and turned these brownies into little bites. 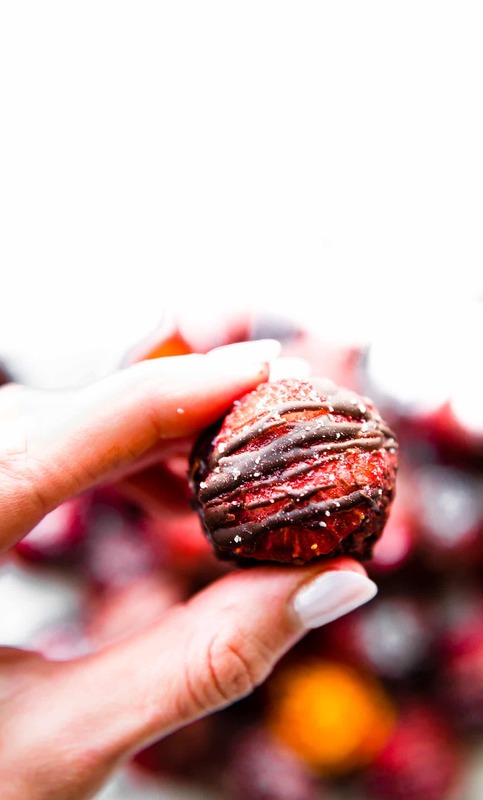 It’s like a chocolate dipped strawberry in brownie form. I haven’t seen that brownie mix yet, but when I do, I hope to pick it up! The perfect bite-sized Valentine’s dessert! You are an overachiever Lindsay! Without a doubt. LOVE Bob’s Red Mill and LOVE these bites! Bro. You know I love your balls. Especially the festive ones. HAHAHA! These are so beautiful! Can’t wait to try! I’ve never wanted anything more than I want these right now! They look delicious! That fudgy inside though….. drooling. So do we put the bites in the fridge or the freezer? Place brownie bites in freezer to set. While the brownie bites are hardening in the fridge, melt your dark chocolate. Just updated it! Thanks! Fridge or freezer work. 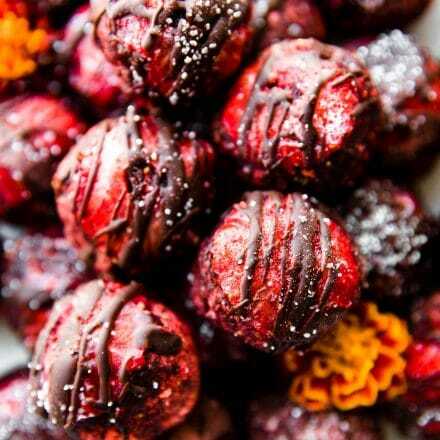 I recommend freezer first, then fridge after coating so the strawberries don’t get too hard. If your brownie batter is really soft, then keep in freezer. Does this help? You had me at brownie. Omg these look so good. And I love how the red pops in your photos! So yummy. Chocolate, strawberry and bit size… YES! Love easy grab and go bites when you need that sweet treat! 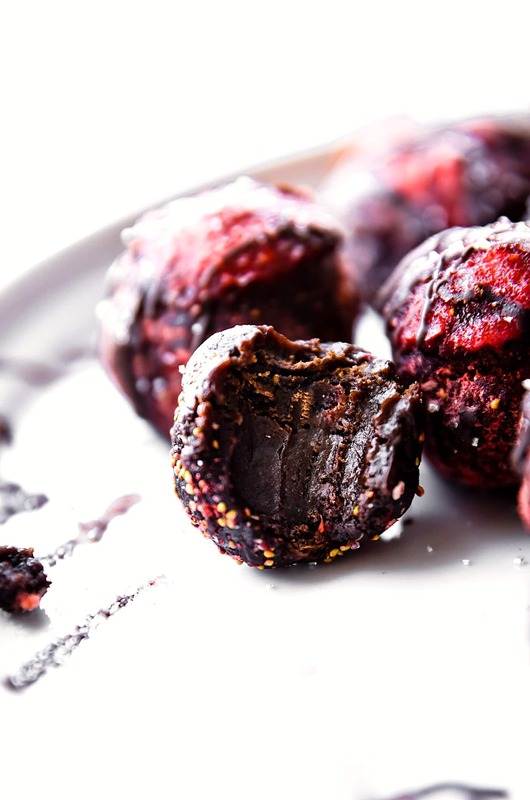 Whoa, these bites are pure brilliance. Send me ALL the brownie bites! These sound AMAZING. Such a tasty flavor combo! this looks so good!! cant wait to try this!